Predators at one of Australia's most northern points are cleaning up frogs and toads hit by cars so quickly that the true cost of road kill could easily be underestimated, Deakin research has found. 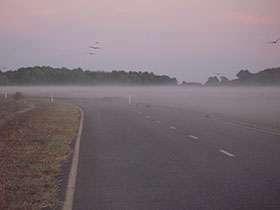 By painstakingly conducting an experiment along a section of the Arnhem Highway between Kakadu and Darwin over many days and nights, Alfred Deakin Research Fellow Dr Christa Beckmann was surprised to find while no nocturnal animals took advantage of the carcasses, as soon as the sun came up the predatory birds came out to feast. The research, Do the Numbers and Locations of Road-Killed Anuran Carcasses Accurately Reflect Impacts of Vehicular Traffic?, was a spin off from Dr Beckmann's PhD which investigated the influence of cane toads on Australia's birdlife. The side project was recently published in the Journal of Wildlife Management, and was conducted to provide insight into the best monitoring practises to ensure accurate data when recording numbers of road-killed wild animals. "We need to know about such processes if we want to estimate how many animals are being killed, or if we want to use road-kill counts as a shortcut way to estimate the numbers of animals living in an area," said Dr Beckmann, from the School of Life and Environmental Sciences at Deakin University and a member of the Centre for Integrative Ecology. "The results of this study will be important for both wildlife researchers and managers, to help properly plan accurate data collection and assess the impact of roads on Australia's wildlife, and to assist with planning ways to minimise impacts such as choosing appropriate locations for wildlife bridges or tunnels." Dr Beckmann's study, completed in partnership with The University of Sydney ecologist Professor Richard Shine, found it was important to monitor areas during a 24-hour period. "We had no nocturnal predators cleaning up road-kill in the area we studied, at Fogg Dam in the Northern Territory, but other areas will," she said. "If we had gone to the area within just a few short hours after sunrise we would have assumed few animals were being killed by cars, as birds had removed most of the carcasses by this time. Overall 73 per cent of carcasses were removed by scavengers. "However as I monitored the area every hour for 24 hour blocks, I was able to capture what was going on at all times, including in the early hours. "I could see that animals had been killed by cars travelling through the area overnight and could also watch the predators, such as raptors, come out to scavenge on their carcasses as soon as the sun rose."